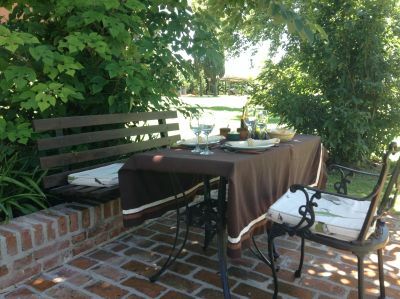 At this estancia, as in many others, meals are often served at one big table where guests mingle and chat and get to know each other. However, not everyone wants that; especially the Argentine guests prefer to sit by themselves. When we have a lot of people, it means we need to get very creative with seating arrangements, since we only have so many tables and so many shady spots where someone can sit. Here is one version of a table for two; two small tables pushed against a little bench. With an extra chair and a table cloth; voila. This entry was posted in Campo, Hotel, Restaurants. Bookmark the permalink.